A British-Iranian mother detained in Tehran has begun a three-day hunger strike in protest against being denied specialist medical care. The aid worker has endured pressure to spy on the UK for Iran, according to her husband, Richard Ratcliffe. Foreign Secretary Jeremy Hunt has summoned the Iranian ambassador to the UK to discuss the case. Mr Hunt has praised her bravery and criticised Iran for – in his words – allowing an innocent mother to feel she needs to resort to a hunger strike. Mr Ratcliffe, said prison officials have refused to let Nazanin see a doctor to examine lumps in her breast and other health issues. He has said his wife also needs neurological care over her neck pains and numbness in her arms and legs, as well as permission to see an outside psychiatrist. He said it was hoped the hunger strike would get the Iranians to take his wife “seriously”. Speaking at a news conference, Mr Ratcliffe set out his wife’s demands – to be able to see an external doctor and to be given an agreement in writing that she will be allowed access to any medical treatment the doctor recommends. Mr Ratcliffe also described how his wife was told by members of Iran’s Revolutionary Guard that she would be “safer afterwards” if she spied on the UK Department for International Development and the civil society organisation Small Media. He said this offer, which she refused, “really pushed her over the edge”. “The only weapon we have is to tell Nazanin’s story,” he added. Speaking to the Observer, Mr Ratcliffe said: “We know a hunger strike has significant physical consequences the longer it goes on for, and Nazanin is feeling a strong sense of trepidation. Mrs Zaghari-Ratcliffe, a charity worker, will consider extending the hunger strike if her demands to see a doctor are not met, Mr Ratcliffe said. Mrs Zaghari-Ratcliffe, of Hampstead in north-west London, spent her 40th birthday on Boxing Day in prison, where she has been detained for more than 1,000 days. Mrs Zaghari-Ratcliffe was arrested at Tehran airport in April 2016 after visiting her family on holiday. She has always maintained the visit was to introduce her daughter to her relatives. 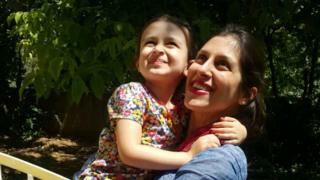 Mrs Zaghari-Ratcliffe was briefly reunited with Gabriella during a three-day temporary release last August. But since returning to prison, after her application for an extended release was denied, she has suffered several panic attacks. Her husband has mounted a high-profile campaign for his wife’s release, with Prime Minister Theresa May, Foreign Secretary Jeremy Hunt and London Mayor Sadiq Khan all calling for her to be freed. 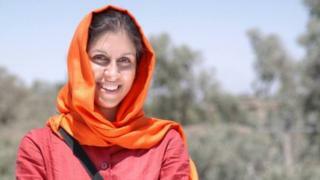 Monique Villa, chief executive of the Thomson Reuters Foundation, where Mrs Zaghari-Ratcliffe works, said: “It is extremely shocking to see our colleague Nazanin Zaghari-Ratcliffe going on hunger strike to protest at her inhumane treatment in Evin prison, at a time where her health is already at its poorest. “I am sincerely worried about the dire consequences of this. “As her employer, I repeat that Nazanin is totally innocent, and certainly not spy material, as portrayed by the Iranian Revolutionary Guard.